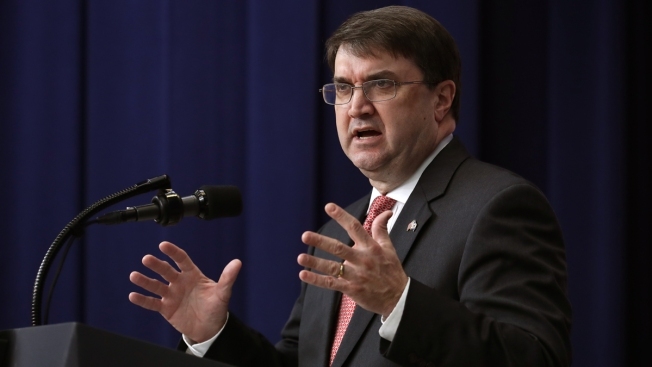 In this November 15, 2018, file photo, U.S. Veterans Affairs Secretary Robert Wilkie delivers remarks during a conference with federal, state and local veterans leaders in the Eisenhower Executive Office Building in Washington, DC. Congress passed two bills this week that help address the ongoing issues faced by student veterans after the Department of Veterans Affairs struggled to pay GI Bill benefits, NBC News reported. The Forever GI Bill Housing Payment Fulfillment Act, which passed Thursday, aims to ensure veterans received all the money they were owed. The Veterans Benefits and Transition Act of 2018, passed late Wednesday, would further protect recipients from suffering consequences because of VA's delay. Both bills await President Donald Trump's signature to become law. Thousands of student veterans received late or incorrect housing payments this past semester because of computer problems at VA, forcing them into difficult financial circumstances. Many also did not receive their tuition payments, which put them at odds with their schools.